Kate Donnellon is "Lisa Sweeney", lead singer of "Sasha's Ashes". Her relationship with Jon is a constant reminder to Alex of what he's lost. Kate, Lead Singer/Songwriter of San Francisco based "Low Hum Satellite", is making her feature film debut. 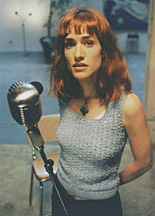 Her band's music is featured in Leutwyler's filmRoad Kill and was the inspiration for the fictitious band "Sasha's Ashes".